We can hope that everybody heard the sound bite, just one more unremarkable non-sequitur in a sea of remarkable, incomprehensible, jumbled effluvium of self-serving, self-justifying Washington opinion. Had it been in newsprint, we might have missed it. But no, courtesy of radio KCBS, came a report (if you can believe it) that many people are starting to think the Patriot Act is eroding and endangering civil liberties. And then, there was the reassuring, confidence-inspiring voice of President George W. Bush, Jr., America’s Great Pronunciator, calmly explaining that he believed that the Patriot Act is defending and protecting our freedom. You can bet that heads turned and eyebrows arched in Europe, Asia, and the Middle East. This country controls 46% of the world’s trillion-dollar defense budget, and this man controls that budget. What does not kill us, makes us strong. Who can not believe that taking away a little liberty, maybe just the small unimportant amenities our heritage made us take for granted, can make stronger those privileges that survive? Does not the gardner prune the lesser twigs and branches, that the whole tree may grow to our design? Taking away a little liberty protects freedom, just as stealing small change and dollar bills off the old man’s dresser makes him guard the bigger bills more vigilantly. Loss of a few small businesses here and there strengthens the economy by redistributing remaining demand among larger, greedier businesses. Lack of tar paper and a few modern appliances gives a home character. The law of averages assures us that once in a while, any policy, no matter how idiotic, will accidentally accomplish the consequences for which it was so nobly drafted. For every 10,000 cargo containers that slip uninspected through the Port of Oakland, there will be one Richard Reid, the blundering buffoon who tried to ignite a fuse on his exploding sneakers, on a full passenger flight at 35,000 feet, with a disposable lighter that didn’t flick. And we caught that buffoon. Well, the passengers caught him. But, we incarcerated him. If you don’t believe it, wait until the jury returns their verdict. Wait a minute, there won’t be a jury. And that’s why the Patriot Act strikes terror into the hearts of suicide-bomber terrorists. We will deal with them harshly. Harshly, but fairly, as we do at Guantanamo and Abu Ghraib. You do believe that all we have to surrender is grandma’s privacy and a few disposable cigarette lighters, don’t you? See, now, I believe that’s what freedom’s all about. Regarding the “somewhat counter-intuitive” quote above, the book cites political correctness, anti-drug, anti-smoking and abstinence-only drives as examples of how most Boomers turned out when it was all said and done, those “freedom loving” rebels of the left and the right from the 1960’s. I always wondered what happened. The disconnect between one’s rights, and the concordant obligation to respect and defend the rights of others, became total and absolute. “Generations”? I may buy the book. This quote, and a fascinating analysis of the book was published in Insight Magaizine, San Francisco Chronicle, Sunday February 6, 2005. The article was “President Bush and the messianic Boomer imperative”, by Vicki Haddock. Osnabruck, Germany (New York Times correspondent Richard Bernstein): according to their commanding officer, the three British Soldiers accused of abusing Iraqi civilians near Basra were acting “out of an effort to stop persistent looting of relief supplies”. Shades of Abu Ghraib? In all of the scandal arising out of that gradual news discolosure and investigation, in which the conduct of US soliders was brought to light, I don’t recall hearing an excuse that pretended that the abuse was somehow justifiable or acceptable. The excuse that abuse of the rules of acceptable human conduct can be tolerated when the victim “deserved it” needs to be understood very clearly for what it is. This is the lie offered in justification of the Holocaust. “They had it coming” is the lie that pretends to excuse almost every mass murder and “ethnic cleansing” since the dawn of history. Underlying the lie, is the presumption that individual leaders, or even footsoldiers, are qualified to make such sweeping judgements on their own, outside of due process and the courtroom. And yet many Americans buy into even this, to some extent. The use of extralegal violence to “teach people a lesson” is still popular and even adulated in the media as a substitute for civil conduct and working within the system. Even this falls apart when the victim himself or herself sanctions the abuse (which was NOT the case with the Iraqi victims). If we read the victims’ statement, “He’s really a very good man. He wouldn’t have beat me if I’d had my hair done properly”, everyone can see not only that this co-dependency is wrong, but that beating itself is way over the line. So let’s hear no rationalizations about how our soldiers are put in a tough spot and occasional excesses are regrettable when they get pilloried by the media. The lesson civil and military leaders are trying to put out, probably in vain, is that we are all accountable for our actions as individuals, wartime or not. Don’t go blaming your victim when you break the law. Everybody is talking about war these days. It is like re-living the 1960’s — and everyone is talking about THAT. World War II flashbacks are now part of our evening viewing of the TV show JAG. Death and dying are again in the forefront of the American consciousness. Below are some observations about this from some notes to a friend. “I hate war, Eleanor hates war, and our dog, Fala, hates war” – attributed to FDR, 1941. I heard from the friend who sent the Kerry/Fonda picture yesterday. Not only are we still speaking but find we are not poles apart after all. And she says she heard the picture may be doctored. No matter. Friendships were lost in the 1960’s over these issues. I hope it does not have to happen all over again 40 years later. Times are tense. Friends are falling out again. This picture from the 1960’s evokes sad memories of angry times. I did serve in Vietnam, and I always thought we were defending the principle that people could speak out against unpopular causes. I still think so. Evidently it wasn’t, because the mailing went on in a very political way to attack Kerry’s integrity and sincerity. 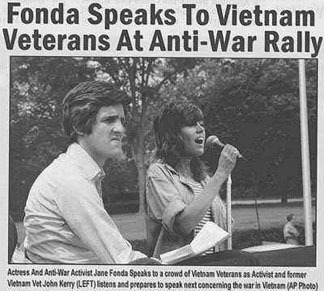 In an unattributed attack, the text accompanying the photo painted Kerry as a coward and Fonda as a “treason queen”. I’m not going to compound the error by posting it to the web. It doesn’t matter whether you were a Fonda fan or not. I wasn’t. This brand of rhetoric was itself cowardly and un-American then. And it is now. Bob Woodward and Carl Bernstein broke the Watergate scandal in August 1972. Ultimately, President Richard M. Nixon resigned in 1974. Will Woodward’s new book “Plan of Attack”, about George W. Bush and his administration’s agenda for the war in Iraq, launch an equally hot scandal? I caught parts of the Woodward interview with Mike Wallace on 60 Minutes. I must say I was not surprised. Being against Saddam does not necessarily mean being for the war or against the United Nations and most of our allies. Whether you view yourself as generally “for” or “against” this war, it is useful to have the text of the 60 Minutes interview. Trouthunter sent the text to me, and I located the text on “60 Minutes” at CBSNEWS.com.